This is a card I made for a very special friend. 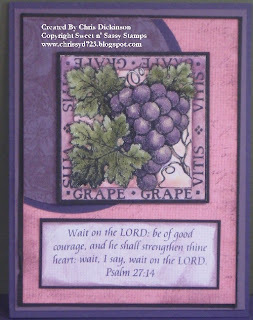 She is going through a difficult time - The stamp of the grapes is one I borrowed from another good friend, Danita and I watercolored it with the watercolor wonder crayons - then I applied red sticky tape on top of it and put a layer of micro beads to it. I hope when my friend recieves it, she will not only enjoy the images but the prayer that was enclosed and the hugs and prayers that went into it while I made it. Accessories: Dimensionals, Red Sticky Tape, Micro Beads, Sponges, Circle Cutter, brayer, Aquapainter, Watercolor wonder crayons. Thank you for looking! Blessings! 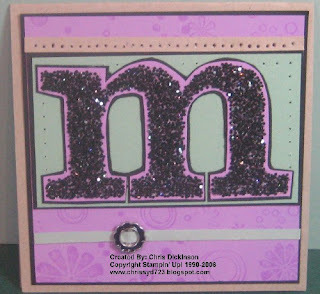 I had a Card Craze this Saturday and this was one of the quick cards we made. Accessories: Chocolate Twill, Jumbo Eyelets, White Gel Pen, Crop-o-dile, Cutter Kit, Dimensionals. 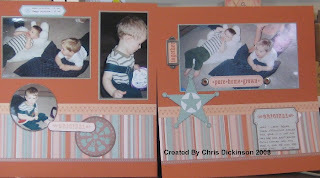 Stamp Sets: Live Your Dream, Rough Texture Jumbo Wheel, Personalized stamp for text - I had it made through Stampin' Up! This is a Sweet n' Sassy stamp and it is called Chocoholic. Do you want to know a secret? Chocolate really isn't my thing. I know, I am sick in the head. I really prefer oatmeal raisin cookies. I can not eat just one. I bought this stamp because my friend Holly loves chocolate and I thought it would be fun to make her some cards with it. You can not tell on this picture - but the cake is cut out and popped up with dimensionals and so is the blocked area with the words Chocolate is a food group. 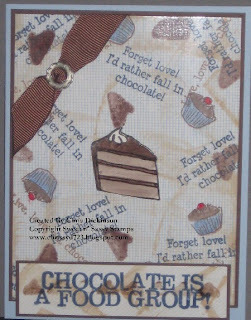 Stamp Set: Chocoholic by Sweet n' Sassy stamps, Canvas BG by Stampin' Up! Thanks for looking! Have a nice evening! I asked what you wanted to see and someone replied - Easier projects. 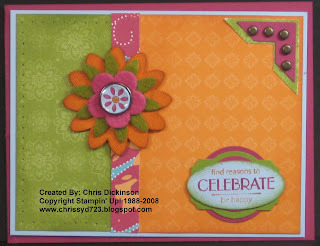 I have a 10-10-20 Card Craze Class tomorrow and needed to come up with a quick project that minimized coloring. My friend Debbie Adams gave me a beautiful card from a swap that I loved but needed to simplify it a bit. I used her same sketch but added and changed a few elements. I also didn't have enough of my Hodgepodge to go around for all class participants and quite truthfully, have a bad habit of waiting until the day before to finish things up before a class. Plus with shipping taking a bit longer, my product wouldn't make it in time since I procrastinated. 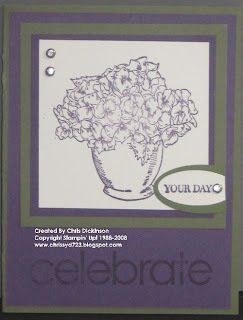 Accessories: For Debbie's card: Aquapainter, Brass Hodgepodge, Large Oval Punch, Watercolor paper For My Card: 1/16th hole punch, Large and small oval punch - Celebrate Stamp set. Debbie's card is the colored version - my card is the non- colored version. Have you ever read a book that was SO good and powerful it has changed your way of thinking dramatically? I read the book The Shack this week and I can not help but share it with you. A few friends of mine and I read it together and once you pick it up, we had a hard time putting it down. Whether you love it or hate it, I believe it will change your way of thinking. You can check out more details at www.theshackbook.com. I recieved a WHOLE PACKAGE filled with Cuddlebugged images from my friend Joan Ervin. THANK YOU, Joan! 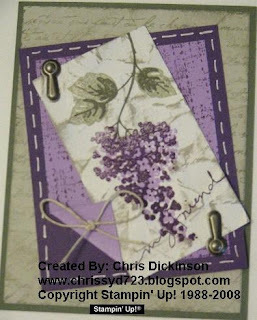 I need a few cards to send out to some friends and made this one using the Splitcoast Sketch Challenge # 169. Thank you for looking and have a fabulous day! Belli Challenge #10 - CHALKS! What is the Belli Challenge you ask? Belli = Embellishments. Each week, I try to give us a challenge that will use things we have lying around our stamp rooms! With a constant flow of new things coming out, I tend to forget about the other things I have and they quickly become clutter! So come join us in the Belli Challenge and be sire to post your link to the card here for a chance to WIN! This Weeks Belli Challenge is CHALKS!!! There are SO many different things we can do with your CHA LKS! 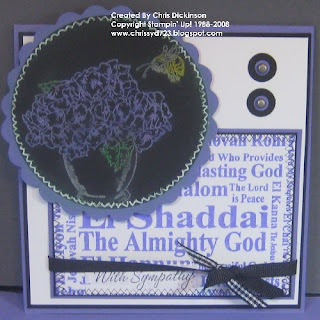 I have never done the Chalkboard technique - so that is what I did with my chalks this week - here is the tutorial for that- done by Beate at Splitcoast stampers Try to use your chalks in a technique that you may not have done before or even use the Chalkboard Technique! Deadline to make a comment with the upload and do the Challenge will be on Monday evening. A random drawing will be held on Tuesday and the winner will be announced on Wednesdays! Last week's winner was Jessica Smith- check out her TOAD-ALLY Cool cards! 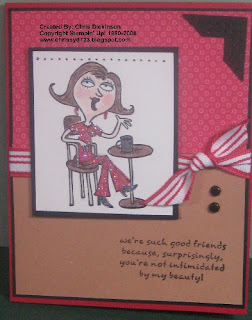 For my cards- I used Beate's Weekend Sketch challenge #40. Check out these and make a comment too for them please! We all LOVE comments. It is fun to see what everyone is thinking about what we are creating! :) Have a fabulous day! I am sorry for the delay in announcing the winner.... the winner is Allison - #14! Congratulations. 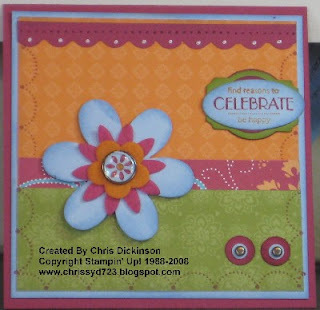 Please contact me with your mailing information at chrissyd723.blogspot.com and which stamp set you would like. Thank you all for your comments. I look forward to stamping tomorrow! Hi! We JUST got home from Alabama and I am exhausted. The Belli Challenge will be one day late this week. I am sorry for the delay but it will be up as soon as I can get to it (no later than Thursday!) Have a fabulous day! I am down in Alabama right now. Enjoying 70 degree weather! :) Back home in Wisconsin, I hear that we have 14 inches of snow! EEK! Anyways - no stamped images as I am on a mini vacation. I will post some thigns next week. I did not want to take a moment to wish you all a Blessed Resurrection Sunday! This Weeks Belli Challenge is GLITTER!!! 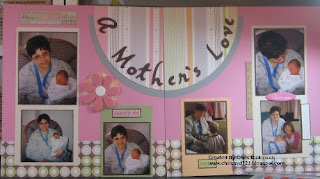 Last week's winner was Liz's Lovelies- check out her beautiful cards! 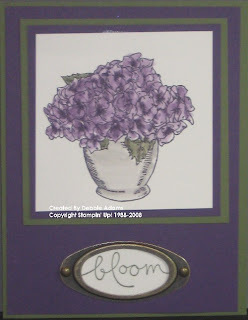 She even hand paints her own flowers and images. GORGEOUS! Today is color challenge day on Splitcoast - you can check out the link and other people's creations here. I just hosted an AWESOME swap and one of the cards I received used this sketch and I thought it was so great. Then I looked at Debby M's sketch for the week and it used this same lay out - so I changed it a bit and used the SCS color challenge 158. Thanks for looking! Have a blessed day! As I look at this card, I see I cut off part of the right side. Sorry. 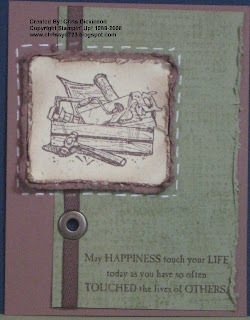 This is a quick card I made for a swap - I keep looking at it and thinking it needs something else but I am STOPPING here! My mom would be so proud! Speaking of which - my mom wrote a poem - I need to post it here. Anyways - this is what I used to make this card! Here is a card for the Belli Challenge. 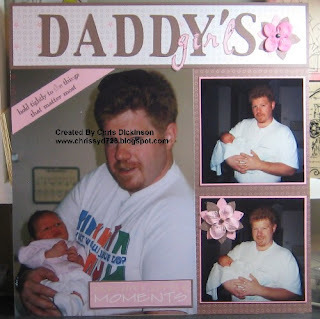 I thought since I did some things for the Belli Challenge with scrapbook pages, I should probably make a card too. The sketch is one from Beate's weekend sketch challenge. Thanks for looking! Have a great evening! What is the Belli Challenge you ask? Belli = Embellishments. Each week, I try to give us a challenge that will use things we have lying around our stamp rooms! With a constant flow of new things coming out, I tend to forget about the other things I have and they quickly become clutter! So come join us in the Belli Challenge and be sire to post your link to the card here for a chance to WIN! This Weeks Belli Challenge is FLOWERS!!! There are SO many different things we can do with your flowers! It can be any kind! 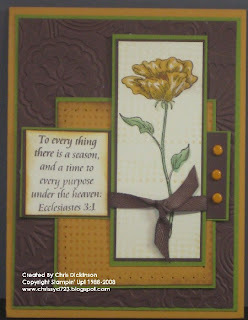 Primas, Felt, Stampin' Up!, pressed, dried, real flowers, etc. try to use things you might not NORMALLY use. Make a completed project and share the link here in the comments linking to my Blog and CBC8. Be sure to post a link to your card mentioning my Blog and the Challenge for a chance to win an assortment of colored 8 1/2 x 11 cardstock from Stampin' Up! 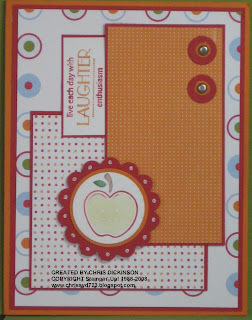 When you post to Splitcoaststampers or to your Blog, be sure and put CBC8 as the KEYWORD and m ention of the challenge! Then make a comment under this with a link to your card and a number so we can do a Random drawing for the winner. 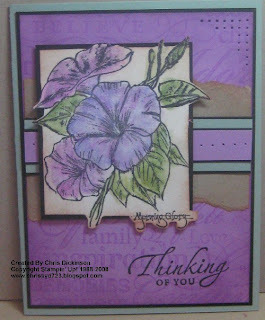 Last week's winner was Nancy Grant- check out her beautiful cards! For more inspiration - Check out these and make a comment too for them please! What do ya think of the two cards? 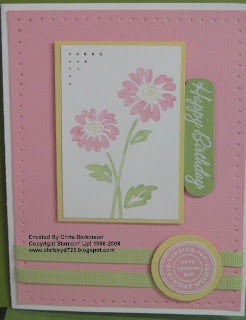 I sat down this afternoon to make a "QUICK" card to have my customers make at Stamp Camp. I wanted to use the Felt Flowers, because I have not used them yet and purchased them when the catalog came out in January. My issue is I can not seem to SEE in my "mind's eye" nice, quick cards. So when I am stamping - I always think "It needs something else." Well, the WHOLE time I was making the card I was thinking that. LOL AHhh!!! Someone come over and help me visualize easier cards! This color combo isn't one that typically work with - anyways - here is my quick card. ***giggle*** I am going to try to redesign it with a little less detail. I am working on a card now - will post it soon! It is late Sunday evening and I just got home a half an hour ago. My children pounced on me and I hugged and smooched on them. I had 5 glorious days with many friends, quiet time with the Lord and A LOT of scrapbooking time. 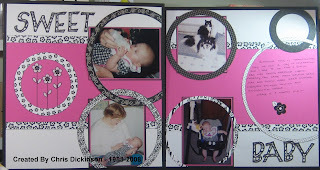 I created 25 Scrapbook pages that only covered a 2 and a half month time span. LOL I will be sharing them through out the week. I look forward to seeing who participated in the Belli Challenge! Belli Challenge #7 - HARDWARE! This Weeks Belli Challenge is HARDWARE!!! There are SO many different things we can do with your hardware! This week's Belli Challenge will be to use your HARDWARE! It can be any kind! Hodgpodge- or other - brads- try to use things you might not NORMALLY use. Make a completed project and share the link here in the comments linking to my Blog and CBC7. Be sure to post a link to your card mentioning my Blog and the Challenge for a chance to win an assortment of hardware! from Stampin' Up! 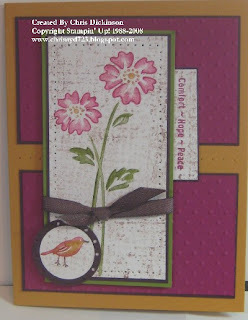 When you post to Splitcoaststampers or to your Blog, be sure and put CBC7 as the KEYWORD and mention of the challenge! Then make a comment under this with a link to your card and a number so we can do a Random drawing for the winner. 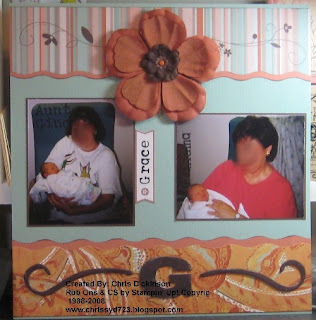 This is a card I made a year and a half ago and posted it on SCS back in July of 2007 when this stamp set first came out. I made a different card yesterday and didn't like the way it turned out, so I will fix it upon my return. I get to go scrapbooking for 5 days! WOOHOO! Accessories: Sponges, Natural Hemp, White gel pen and Pewter Hodgepodge, 1/16th hole punch. I've been TAGGED three times! Debby M, Holly and Nancy have tagged me. I'm supposed to tell you 7 random facts about me, and then turn around and tag some other girlfriends. I should be packing, but I am the QUEEN PROCRASTINATOR so I sit here and am thinking about making a card for tomorrow's Belli Challenge but not feeling very inspired. a. Eat, Pray and Love by Elizabeth Gilbert - not really a book I would normally read but a girlfriend asked me to read it with her and I wanted to see what it was about. d. Don't Sing Songs to a Heavy Heart, by Kenneth C Haugk, Ph. D.
a. Daniel, By Beth Moore - this is an online study with a video series I am doing this with my 16 yo dd- EXCELLENT! 2. I am a hair dresser/ cosmetologist by trade. 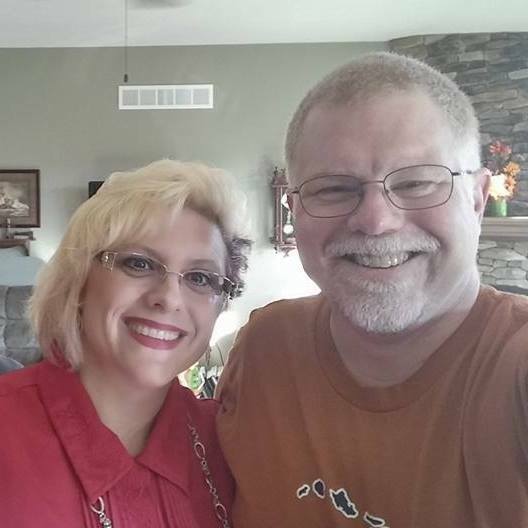 I worked various office jobs and decided to stay home with my children to Homeschool them 11 years ago. 3. I played the saxophone for many years and love to sing. But do not do that well! 4. When I was a kid, I always used to say 3 NEVERS... I would NEVER marry a red head (I did. ), I would NEVER have any children (I have 4 beautiful children), and I would NEVER drive a station wagon or a mini van (I do not drive a station wagon but I do drive a mini van.) I would tell my sister when I was in my early 20's that she looked like a camp director with all the kids in her mini van and she should have a whistle around her neck. 5. I LOVE to laugh and the weirdest things ALWAYS happen to me. I am so looking forward to going on this scrapbooking retreat! My mom, my friend Shelly and several other good friends get together and go and we laugh SO hard our faces hurt. I need Sunday to come, so my cheeks and my face can stop hurting from laughing so much. 6. I LOVE to draw and doodle. I think that is where my love of stamping comes in. In my mind, on my cards...one layer is never enough. ***giggle*** More is always BETTER. Now for the rules and who I am tagging. Do you know for the past few years, I have said to my family - I am not fat - I am FLUFFY!? LOL My dh in love always said nooo dear you are fat. HA. Today, the joke is on him. For the past 4 days I have NO sugar and nothing with white flour. Which I have found my mood a little under my normal cheerfulness. He said, Honey, I would rather have you fluffy and cheerful then thin and crabby. Eat some SUGAR! LOL I have not eaten any. I am on a MISSION to get healthy this year! 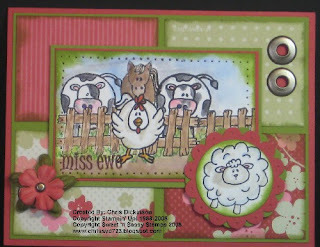 Last week, I was honored with the offer to join the Design Team of Sweet n' Sassy Stamps! 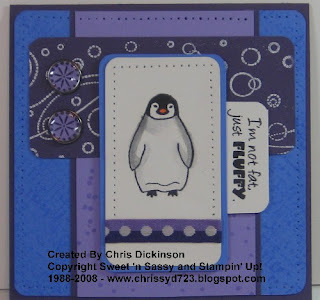 Here is a card using their stamp set Penguin Hugs.